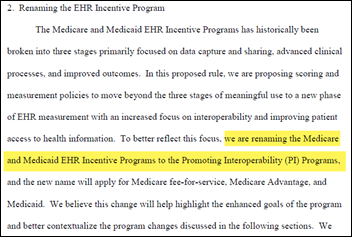 CMS proposes renaming the incentive programs to “Promoting Interoperability Programs,” noting that the word “incentive” is obsolete now that most payments have ended. The rule would require using CEHRT certified for the 2015 Edition beginning with the 2019 covered year. It would allow a 90-day reporting period for 2019 and 2020. 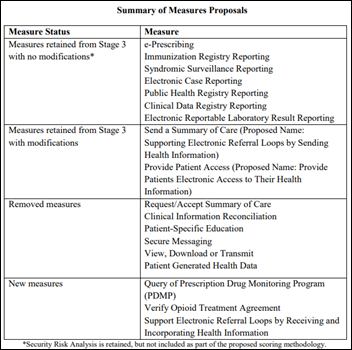 HHS also proposes two opioid-related e-prescribing measures for connecting to PDMPs and verifying treatment agreements that would be optional for the first year. The proposed changes would also require hospitals to publish their charge master price list online every year, but asks whether more specific information might be useful to consumers, such as details on a hospital’s average discounted charges across all payers. HHS also asks if providers should be required to disclose a patient’s out-of-pocket cost for a service before performing that service, presumably to reduce surprise out-of-network charges. The public’s comments about the 1,900-page document are due June 25. From Stealthily Healthy: “Re: HLTH conference. I’ve been asked a dozen times if I’m attending and I’m uncertain. What do you think?” Beats me. The speaker roster is huge, which I expect is because the VC-funded first-time conference used its cash to pay expenses and hype it up a bit. They’re also offering free provider registration hoping to give vendors their money’s worth in corralling prospects. I’m not sure anyone’s thrilled at going back to Las Vegas in early May after just leaving HIMSS there in March. The big question is whether it will do well enough financially to warrant a repeat next year. 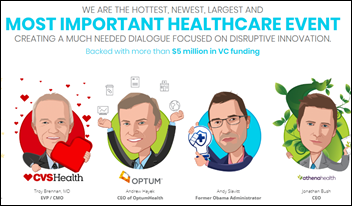 The conference claims it will create “a much-needed dialogue focused on disruptive innovation in healthcare” even though it’s run by two tech guys with zero healthcare experience and the track record of folks waving the “disruptive” flag without understanding what they’re disrupting isn’t great. We have way too many healthcare conferences, but fortunately for those offering them, way too many people willing to spend their employer’s time and expense money to attend them with questionable outcomes beyond glad-handing self-validation. Ironically, I would bet that high-accomplishment conference presenters didn’t actually waste their early-career time attending those same conferences. From System CIO: “Re: HIStalk. It’s a really valuable read for me. I’m not one of those CIOs who is constantly networking with everything and everyone in our industry to keep up (primarily because there’s so much work to do and time necessarily spent focused inwardly) but HIStalk allows me to see/stay connected more broadly. Thank you for all of the time and effort you spend to make it what it is.” Thanks for making my day. I’m getting good responses to this week’s question. I’m sure yours would be even better (hint). I’ve seen video from recent conferences in which attendees were urged to hug each other, dance at their seats, or exchange high-fives, all of which seem not only to be crassly contrived, but straying way outside the comfort zone of many in the audience. I remember one hospital management event I attended where they hired a super-cheesy motivational speaker (some local guy who formerly played in an awful rock band with small talent and big hair) who demanded that we all “share” with our tablemates, which made me want to rip off his $2,000 suit and choke him with it. At the long-awaited end of his de-motivational speech, he brought up a slide of his wife and fake-cried about how much he loved her, leading all of us recent sharers to wonder what exactly we were supposed to do with that. Dear conference organizers and presenters – just do your presentation without expecting the paying audience to do anything except watch. Or just thrust your microphone Ozzy-style at the crowd and let them read the slides while you wiggle your hands approvingly as a conductor rather than performer. 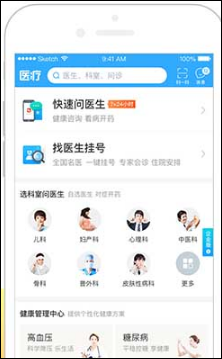 China’s largest Internet healthcare platform, insurance subsidiary Ping An Healthcare and Technology, plans a $1.1 billion IPO on the Honk Kong exchange. 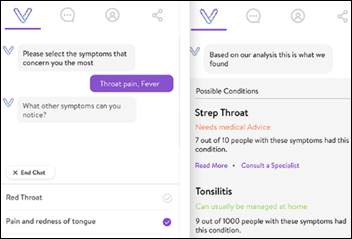 The 900-employee, AI-assisted service provides 370,000 free consultations each day and offers free, two-hour prescription delivery in major cities. Its network includes 3,100 hospitals and 7,500 pharmacies. Reports from a year ago suggested that investors were losing interest because of profitability concerns despite huge demand that is driven by dissatisfaction with China’s overwhelmed healthcare system. Twitter co-founder Biz Stone invests an unspecified amount in India-based Visit, which offers AI-supported video visits. War Memorial Hospital (MI) expands its use of FormFast electronic forms and workflow solutions, integrated with Meditech 6.1. Mobile technology vendor Dictum Health adds a video laryngoscope to its Virtual Exam Room platform. 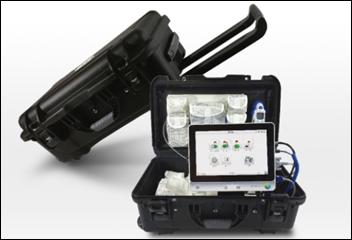 The company offers a suitcase-sized patient examination system, an in-clinic telehealth system, and a medical telehealth tablet connected to cloud services. A small KLAS study on clinical process improvement finds that Stanson Health and LogicStream Health lead the way in analyzing clinician EHR use to optimize alerts and order sets, respectively, and identifying training opportunities for individual users. KLAS also finds that while many clinicians don’t trust the data presented to them or ignore recommended care guidelines and workflows, frontline doctors say that tools from Stanson and LogicStream are easily understood and useful. Kansas-based transcription firm Medantex takes down its customer web portal after security researcher Brian Krebs notifies the company that its audio recordings and site administrative functions were wide open to any Internet user. 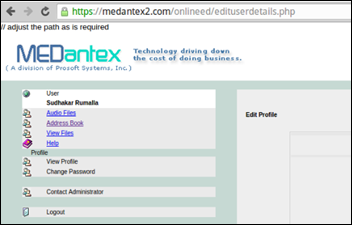 Medantex says it had been attacked by WhiteRose ransomware and apparently misconfigured the servers it rebuilt, exposing them to the world. I tried to pull up the company’s public webpage and was blocked by Bitdefender’s malware detection system. 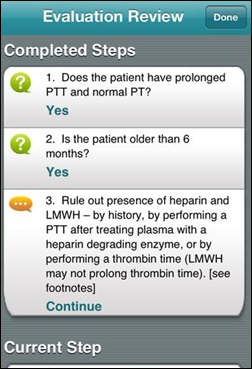 A small study finds that anticoagulation lab test and drug ordering improves when physicians use the CDC’s PTT Advisor app. The family of Prince sues Trinity Medical Center (IL) for failing to correctly identify the counterfeit drug he had taken before the singer’s private plane made an emergency landing in Moline on April 15, 2016. They’re also suing Walgreens for filling his narcotics prescriptions that were written under his bodyguard’s name. Prince lied about his drug intake and refused all testing in the hospital in hopes of concealing his years-long addiction from the public, but the family says the hospital should have run extensive tests to determine that the black market drug he thought was Vicodin actually contained fentanyl. He died six days later of a fentanyl overdose. That’s the disadvantage of being a celebrity addict surrounded by sycophantic coat-tailers– your star-stuck doctor will write any prescription; your handlers will get it filled under their name and score illegal drugs to supplement when necessary; and you have enough time, money, and enablers to make addiction seem like a normal response to pain, stress, or disappointment. IMAT Solutions will exhibit at the National Association of ACOs spring conference in Baltimore April 25-27. LabFinder.com will use Ellkay’s integration services to connect with physician office EHRs. Obix Perinatal Data System vendor Clinical Computer Systems, Inc. earns SOC 2 and HITRUST certification. AdvancedMD will exhibit at ACOG April 27-29 in Austin, TX. Aprima will exhibit at AROC April 25-26 in Atlantic City, NJ. Arcadia will exhibit at the NAACOS Spring 2018 Conference April 25 in Baltimore. AssessURhealth publishes a new customer success story featuring LoCicero Medical Group. CarePort CEO Lissy Hu, MD will present at ACMA National April 26 in Houston. Netsmart receives the first ONC-Health IT 2015 Edition Certified solution for palliative care. Spok and Bernoullli Health partner to improve clinical alarm management. The local paper profiles CoverMyMeds after its top ranking as a best place to work in Columbus, OH. CTG will exhibit at the Texas Regional HIMSS Conference April 26-27 in Dallas. DrFirst VP Linda Fischer will participate in a panel discussion at the Critical Connections’ Opioid Crisis Symposium April 25-16 n Baltimore. Consulting Magazine names Divurgent Principal Ralph Whalen a 2018 rising star in healthcare. EClinicalWorks will exhibit at the 2018 Physician Practice Management & ASC Symposium April 25-26 in Nashville. Healthwise will exhibit at GetWellNetwork’s getconnected 2018 conference April 30-May 2 in National Harbor, MD. InstaMed will exhibit at the Georgia MGMA Annual Conference April 29-May 1 in Savannah, GA.
AWS features Kyruus in its coverage of hot startups for April 2018. I was taken by the tongue-in-cheek wit of your cartoon above Stealthily Healthily’s comment. Then I clicked on it and realized it’s the actual, very real, non-tongue-in-cheek ad for the HLTH conference. Wholeheartedly agree with System CIO’s comment. I like him/her do not have time for HIMSS, CHIME, etc., as I am heads down with massive simultaneous implementations across our system. I deeply appreciate the content and delivery of HIS Talk as most weeks it is the only industry specific news I can digest. Anyone besides me disturbed by the title of the Healthwise webinar listed? “Converting Consumers into Patients” — Shouldn’t the goal be to convert patient to non-patients, and make sure they’re well-informed consumers if they must be patients? My point is not that a cheesy unmotivational speaker is good, but rather that most presentations done in a lecture format deliver far less educational value than methods that engage the learner. I get that you are a no-nonsense guy, and I really don’t want to hug people I don’t know either, but we can do better than a talking head and a PPT. I agree for a class, where an ongoing relationship is important — you’ll be spending time with the instructor and fellow students over weeks. Learning styles and formats are important to cover the specific body of material that’s required. I don’t think it adds value in a room full of strangers who won’t see each other again and for whom passive listening is perfectly fine since there’s no prescribed outcome. For me, it’s intensely uncomfortable to be pressured to “find someone you don’t know and introduce yourself.” It seems awkwardly weird regardless whether I do it or not and I’ve yet to see any benefit in having done so. It does not elevate my mood, instill a sense of camaraderie, or feel inwardly grateful that the speaker wisely forced me outside my comfort zone. Mostly I just mentally curse the presenter for digging into the Presentations 101 bag of cliche icebreakers. Just give me the obligatory on-screen cartoon and joke and move on. I’m with you on the icebreakers and other “interacting for the sake of interacting” types of things. I appreciate the socially-awkward person’s guide to the sign of peace…growing up Lutheran, I dreaded this moment every Sunday. I thought I was alone! I witnessed a noted health IT leader do the same “tears after telling a story about how he didn’t treat his wife well enough” at a state HIMSS conference several years ago. He left her for a younger model the next year. Personal lives happen, I get it, but don’t mix it into your professional, especially when it lacks sincerity. On your comments about the disruptive term and failure of conferences run by non-healthcare folks, why don’t you run a piece that outlines what you think ‘is’ disruptive? Lord knows what hospitals are doing now could certainly improve. It is better than ever, but that took government bull whips. Would be great to see innovation drive change.